Oh yeee-air. Get your pencil cases primed, your kettle switched on, and the do not disturb sign on your door, it's time... The 2014 ToDryFor Design Competition has begun! The lucky winner's design will become part of our existing line-up of talented artists, which includes Gemma Correll, Rob Ryan, Julia Pott and other highly acclaimed individuals. 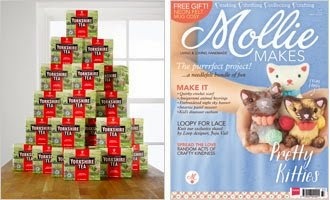 As well as receiving five free samples, on-going commission payments and international exposure through press and worldwide stockists, the lucky winner will also receive a year's subscription to Mollie Makes magazine and a year's supply of Yorkshire Tea. Two runners-up will also receive a bumper box of goodies (including Beast In Show mugs and biscuits). Wowsers! The top 15 designs will be whittled down to the final three by our super-amazing guest judges, Michelle Alger, Head of Home for Heal’s and Mollie Makes Editor, Lara Watson. If you want a heads up on what usually takes our fancy, why not view the gallery of previous year's entries over on our facebook page, or take a look at the 2011, 2012, and 2013 winning designs. The closing date for entries is Monday 14th April 2014.